If you knew me you’d know I see life as smoke. Ash, embers, ruins. Flames, it’s all that we are. And I’ve been burning since birth. As a child I grew among the old burnt-out black forests. And as I aged, the scent of smoke became my fragrance, longing, and desire. A birth-rite. It’s in all of me and everything I do. For nothing has ever served me better than the strength of fire. Being extinguished, put-out, reignited, lit by a single match possessed from a single hand. There’s nothing more beautiful than showing the world you burn, how it made you burn, and how you continue to burn. And I live to burn. I’ve always been burnt. I’m burning, I’m enflamed, I’m smoked. And if you come near the fire, light the fire, love the fire, you’ll burn too. 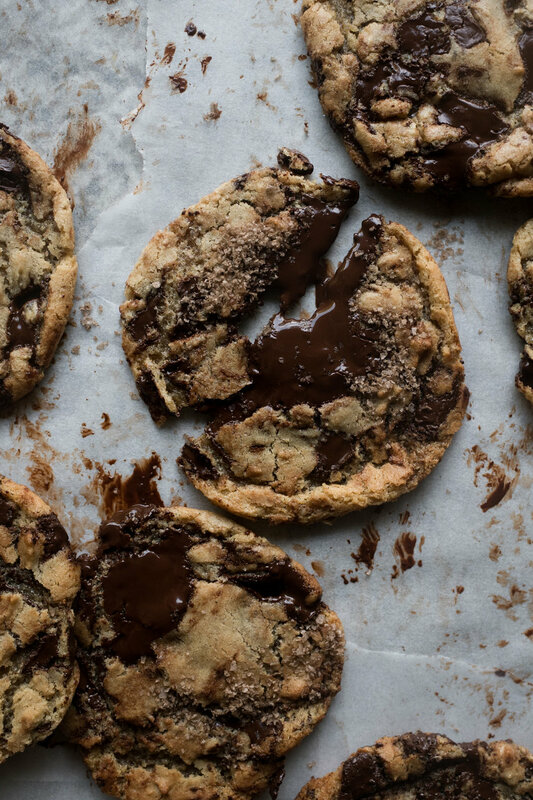 Smoked Tahini Dark Chocolate Chunk Cookies to demonstrate my current mind. They’re rich and decadent cookies, filled with an earthen interior, molten chocolate pools, and deep flavoral notes. Tahini has always been a great love of mine. As too has smoke. And there’s three types of smoke within these cookies. Smoked Applewood salt from the Yakima valley, hickory liquid smoke, and smoked dark chocolate. That could be an overwhelming amount of smoke, I know. So, I’ve left each as optional. Use what you have or can get your hands on. A regular dark chocolate can be replaced for the smoked dark chocolate. Fleur de sel or flaked salt can be replaced for the smoked Applewood salt. Liquid hickory can be omitted. But do incorporate some element of smoke within these cookies. Smoke, chocolate, and sugar, it’s a combination that just works. If using regular dark chocolate, try to use a block that contains a minimum of 70% cacao solids. The slight bitter edge compliments all the cookie sweetness, perfectly. If you prefer a sweeter cookie, use a dark chocolate that contains no less than 55% cacao solids. Also, try to use the best quality block of dark chocolate you can find too. And chop the chocolate block roughly. The larger the chunk, the easier it will spread into a molten pool of chocolate. Just make sure that the chunk is of a size that can fit into a cookie scoop or be rolled into a tablespoon sized ball. The tahini used should be very smooth and runny. I find that towards the end of the jar the tahini almost always has become quite thick with a limited amount of natural oil left. So, I would recommend using a tahini straight from an unopened jar. Just make sure to give it a gentle stir before use. You should get about 30-32 cookies out of the dough by using a small cookie scoop (1” or 2.5 cm) or 1 tbsp. as a measure. For slightly larger cookies, use a medium scoop (2.8″ or 7 cm) or 1 ½ tbsp. as a measure. Place the unsalted butter into a medium sized saucepan set over medium-low heat. Heat, stirring occasionally, until melted. Pour the melted butter into a large mixing bowl and add in the light brown sugar and granulated sugar. Whisk until well combined. Add in the egg and whisk until glossy. Add in the vanilla bean extract, hickory liquid smoke (if using) and tahini. Whisk until well combined, about a further minute. Set the bowl aside. In a separate medium sized mixing bowl, whisk together the all-purpose flour, baking powder, baking soda, and salt. Add half of the dry ingredients into the bowl with the butter and sugar mixture. Use a wooden spoon to mix until just combined (some dry flour pockets should remain). Add in the remaining dry ingredients, again, mix until just combined. Fold in the dark chocolate chunks until evenly incorporated throughout the dough. Cover the bowl with a layer of plastic wrap and set it in the refrigerator to chill for at least 30 minutes and up to 1 hour. Meanwhile, pre-heat the oven to 180 c (350 f). Line three large baking sheets with non-stick parchment paper. Using a small cookie scoop, or a generous tablespoon as a measure, roll out as many balls out of the dough as possible. Arrange the dough balls evenly amongst the baking trays, then, sprinkle over a little of the smoked salt. Bake, for 10 to 12 minutes. Half-way through baking, open the oven door and raise the cookie sheet by a few inches (The cookies should be beginning to puff in the middle). Use a little force to tap it against the oven rack, so that the cookies deflate slightly. You should see the chocolate begin to spread. Close the oven door and let the cookies bake and inflate again, for a further minute. Again, repeat the raising and tapping process above for a total of 2 more times. 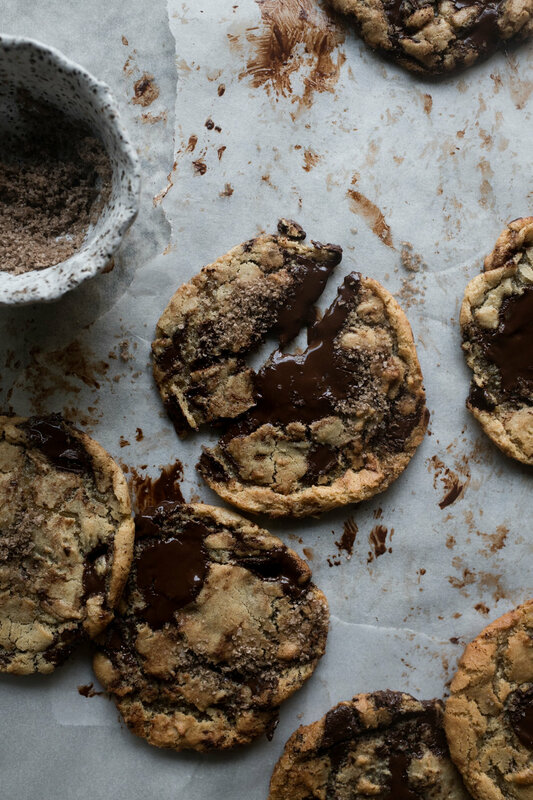 The cookies should be just crisp around the edges, and the middles should be beginning to set with chocolate puddles throughout. Remove from the oven and let the cookies cool on their baking trays for 10 minutes, before carefully transferring them to a wire rack to further cool slightly, before serving.